LEARN WITH YOUR CLUB MATES, OR JUST YOUR MATES! Tuition custom made for your group. Whether its your club mates, your private facebook group, or just your riding buddies? Sometimes its easier in a session with people you’re already familiar with. If you have a group of like-minded riders, we can tailor a course to take in all the things you want to concentrate on. If you know what you like and your mates do to, the we can help. There courses are for any type of group that would like to concentrate on specifics or even the content of any of our existing courses. We will focus on exactly what you need and pace the day and its content to suit your group. 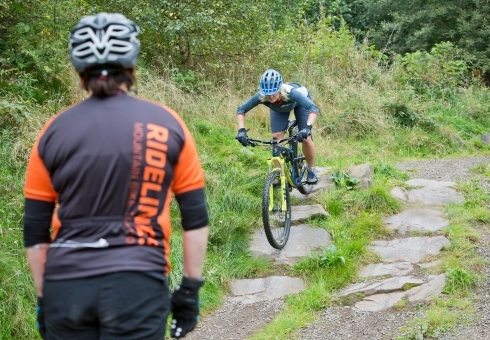 Our Group mountain bike tuition sessions will boost your groups riding ability. We’ll help break down personal barriers and challenges to your riding, developing riding styles that flow, helping you in your every day riding, race entry or event. We’ve worked with hundreds of riders, club members and groups over the years. We have the experience to identify and explore the areas of your technical riding. We can smash barriers that may exist that keep you from really achieving your own riding goals. So if it’s building your confidence and improving technique? No problem! If it’s effective cornering, riding with more attack and speed, getting your wheels off the ground? No problem! Taming technically challenging trail features, choosing the best line or tackling tricky black graded sections? We can cover it. – improvement is guaranteed on our Group mountain bike tuition days. We’ve worked with small groups of friends or club members working towards a single event. And groups entering events such as the REDBULL foxhunt, Tweedlove Enduro and Glentress 7 events, POC Scottish Enduro Series, and various Downhill races. 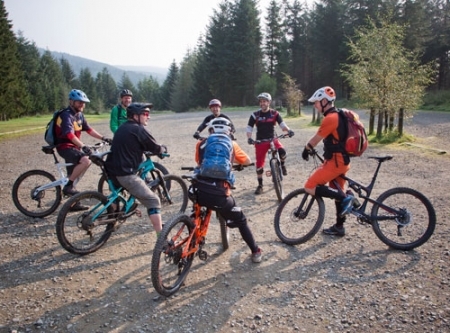 Our Group mountain bike tuition packages have ensured that every rider feels prepared for their own personal challenges. We’ve also worked with larger numbers of club riders on custom made single or multi day programmes covering technical trail challenges, mental preparedness, fitness, pacing, nutrition and team strategies. Get in touch to let our experienced team of instructors help your group with tuition and advice. We’ll use our progressive coaching and tuition methods developed out on the trail over years with hundreds of riders to boost your technique! Sessions generally run from Glentress Forest or Innerleithen. Half, full or multi day bookings with start and finish times and group sizes are flexible. We can organise sessions as you need them and work with as many riders as possible. Please contact us if you have any questions about our Group mountain bike tuition courses. 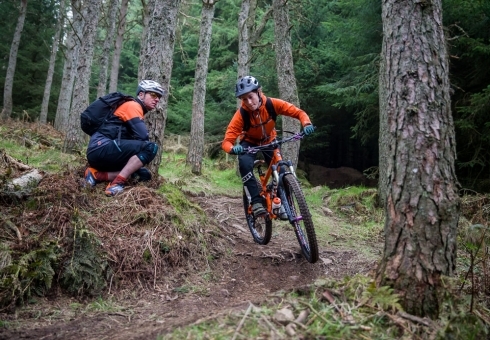 Sessions generally run from Glentress Forest, Peel Car Park or Innerleithen or hand picked trail in the Tweed Valley, Edinburgh or West Highlands. Speak to us at the time of your booking. Standard day runs 9:30am till around 3:30pm but we can be flexible. Gain insight into your riding on your terms. 100% personal attention with the focus on what you need at a pace that suits you. Whether you’re an absolute beginner or a seasoned and experienced rider and racer, we’ll provide a personalised insight into your own riding, break down personal barriers, boost your riding confidence and develop your techniques and skills to improve your riding. A Proper Family Day Out on the trails. Get out, get active, get yourself along to the peaceful setting of Glentress Forest and have tons of fun with one of our family days out. Fulfilling fun in an awesome forest setting with some challenges thrown in! Memories are made of days like this. We’ll teach you the basics for riding your bike on the starter (green trails) and give you an idea of what it’s like to properly experience the outdoors by bike. This course is for literally anyone. The only prerequisite is that you can ride a bike when you arrive! Women’s mountain bike skills lessons with Jess Stone. All of our Ridelines instructors are selected 100% on merit. Male or female, they are all here because they are at the standard that maintains our excellent reputation. However, we constantly listen to feedback from our clients and we know that some women like to be tutored (and inspired by) female coaches. So we have introduced specific slots for female riders. The same high standard and inspirational learning delivered by the best female mountain bike coaches.